Learn how to mix colour with this set containing 5 x 14ml tubes. Gouache is very similar to watercolour but have an opaque appearance. It works well when working with flat, brilliant colours most often used in design and illustration. Includes: Primary Yellow, Primary Red, Primary Blue, Ivory black, Zinc White. 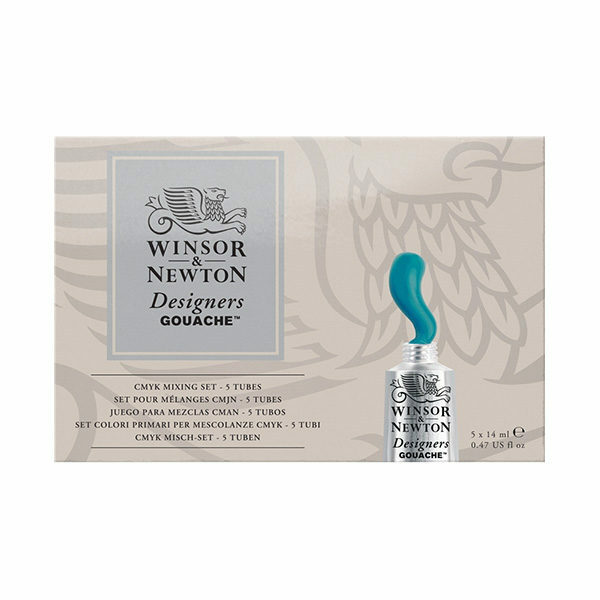 Winsor & Newton has made Designers’ Gouache since 1935 but has continued to update and improve it. Made up with pigment, and bound with gum arabic for quick drying, it contains none of the chalk added to lesser brands, giving it great covering power and a matt finish when dry. With Oil Paints, the pigment is suspended in oil, most commonly Linseed oil. The oil is what extends the drying time of oil paints allowing the artist to have plenty of time to blend on the canvas. Also, due to the presence of oil in Oil Paint, they need to be thinned with oil or solvents. Brushes must also be cleaned by solvents such as turpentine. When it comes to colour, oil paints have more pigment in them, allowing richer, more vivid colours. Paintings take a long time to dry. Acrylic Paint and Gouache is water based. The most common form of Acrylic Paint is a plastic latex or emulsion, soluble in water. This is why acrylic paints dry quite quickly and can be thinned and cleaned up with water. They are very popular among artists who like to work quickly. Acrylics may also darken slightly as they dry, while oil paints do not. The main difference between oils and acrylics is drying time. Acrylic paint will dry within an hour, if not within fifteen minutes. Acrylics will adhere to almost any surface, but the most common are canvas, wooden panels, metal and paper. Acrylics can also be used on internal or external walls, making it very suitable for murals. Wet acrylics are water-soluble, but once dry, they are waterproof and durable in most environmental conditions. Acrylics allow for a wide range of techniques. Used directly from the tube, acrylics are opaque and can be worked in a way that is similar to oil paints. There are various acrylic mediums available that can be mixed with acrylic paint to extend drying time, change the glossiness, add transparency or otherwise alter the properties of the paint. 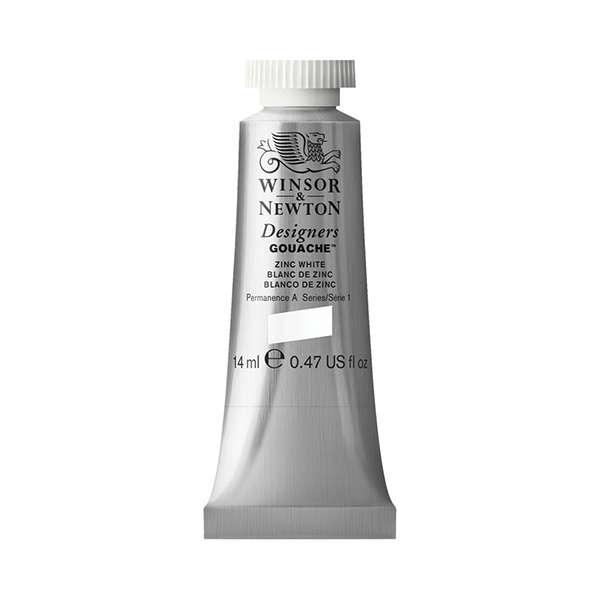 Thinned with water or an acrylic medium, acrylic paint can be applied in transparent glazes. Acrylics are also very suited for thick, impasto applications where texture is built on the canvas. Gouache is very comparable to both acrylic paint and watercolour paint but is its own entity. Gouache paint is opaque but becomes translucent when water is added. At its most basic, gouache is opaque watercolour. It is made of pigment suspended in a binder, which is often gum arabic. The most common surface for gouache, like watercolour, is paper. While gouache has a long history of use by artists, its flexibility and reproducibility has made it more popular for illustration than fine art in modern times. Once dry, gouache remains soluble to water, allowing for blending even after the paint has dried. Gouache is a flexible paint that can be thinned and used like watercolour or applied thickly to take advantage of its opaque properties. Gouache is particularly suited to laying in large areas of solid colour. Two colours can be blended by working wet on wet or by placing the colours next to each other and going over them with a damp brush once the paint is dry. Gouache can be used in glazes to build up colour slowly. Once a layer of paint is dry, it can be worked into with wet paint, allowing you to blend the paint you are applying with what is already on the paper. Gouache paintings should be protected behind glass.